Project communications: To blog or not to blog? We have all been told that communication with all stakeholders, particularly the core project team, is one of the central responsibilities of the Project Manager. We support this idea and have mentioned it in several of our previous articles. You may have seen a well-known communications formula of ‘N(N-1)/2’ used as proof that the addition of new members to any program or project team increases the number of communication channels exponentially. For example, if your team increases from 15 to 17, the number of possible communication channels goes up by 31; try the calculations and you’ll see what we mean. Because each project phase requires the appropriate emphasis at a given time, the number of channels the program or project manager must manage varies throughout the lifecycle of a project. For example, in the early stage of a project – let’s call it Preliminary (or Discovery, the term we use in our article “Nine Essential Steps for Project Success”) – you may have a relatively low number of channels because you are only working with a few key stakeholders. In contrast, in the Execution or Deployment phase, your team will be fully engaged with many people. 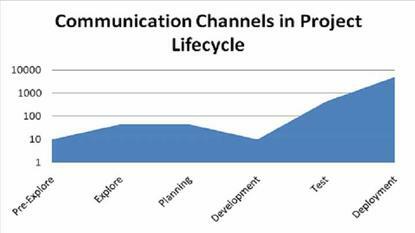 Further, communication by the project manager is a key area of focus as the project lifecycle draws to a close. Figure 1.1 below illustrates an example/typical scenario. (Note: the lifecycle phases are examples; your organisation probably has different ones). Clearly, managing communications with a large number of users can be challenging. As program / project managers, we are typically overly reliant on email to both send and receive written messages to stakeholders. This may entail managing a distribution list, and you can never be sure if you are over-communicating or under-communicating. In terms of communication, a good rule of thumb is that it’s better to over-communicate than to do too little. We strive to be ‘masters of our craft’ and, therefore, we want to find a method by which we ensure that necessary and sufficient information is communicated, and that we are not saturating our team, customers, and other stakeholders with ‘ToMITO’ (Too Much Information Too Often). A blog (a blend of the term web log) is a type of website or part of a website. Blogs are usually maintained by an individual with regular entries of commentary, descriptions of events, or other material such as graphics or video. Entries are commonly displayed in reverse-chronological order. Blog can also be used as a verb, meaning to maintain or add content to a blog. Most blogs are interactive, allowing visitors to leave comments and even message each other via widgets on the blogs and it is this interactivity that distinguishes them from other static websites. As of 16 February 2011 (2011 -02-16)[update], there were over 156 million public blogs in existence. Are there downsides to blogging? For sure. Blogging will not be the communication mode of choice for all stakeholders, and it is certainly not the only channel to use. As with any well-planned project, you should conduct a full stakeholder analysis and build your specific communication plan based on the needs of your project team and their stakeholder “circle of influence” (using models such as the RACI one to determine who is Responsible, Accountable, Consulted and Informed). We also all know that stakeholders come and go on projects, so remaining current is vital. As stakeholder needs vary, a Blog will not be “The method” for everyone, and you may have to duplicate information in different formats. This is a “fact of life” for projects, and not necessarily a bad thing. For example, if you have an IT project in the Testing phase, or a construction project and are carrying out the “punchlist” or “snagging remediation works,” a Bug/Issue/Defect report on a Blog may not be appropriate – it may be too detailed. But a high-level summary may be appropriate for summary reporting to certain stakeholders. You will need to agree on the appropriate use of a blog and determine what should be tracked in formal documentation and other mediums of communication. In conclusion, ‘Blogging’ can be a great ”string to the bow” of the Project Manager for communicating information about your project to appropriate parties. Blogging should not be used to communicate all levels of information and its use should be planned, based on stakeholder communication needs as identified and agreed upon in your project communications plan. Effective blogging is a skill. Much guidance material is freely available on the Internet. If you are unfamiliar with blogging, we recommend you review a few of these readily available resources by searching for "tips for blogging". Lastly, always follow standard legal, business confidentiality and corporate guidelines and ensure you respond daily to your blog comments.